If you’ve been a regular listener of this podcast, you know I frequently talk about the importance of niching down your business, so you are easier to find and recommend. Melissa Hall makes an interesting case for specializing in being a generalist in your area of expertise. She’s an attorney who practices what she calls, “cocktail law”. She spends an average of just 12 minutes with each of her clients. I like to think of what she does as practicing “on-demand law”. When you need a specific legal question answered, but want a trusted answer, you can go to her! 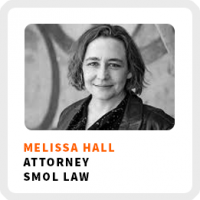 You can learn more about Melissa’s firm at smol-law.com, Smol Law. How she turned “cocktail party law” from a burden to a business model. Why lawyers are actually selling relationships and conversations. Even lawyers suffer from imposter syndrome. The importance of learning life skills in the legal profession. Core work activities + habits: 1) Talk to people. 2) Talk about her practice to people who can potentially reach her target audience. 3) Build and maintain her technological infrastructure. Ideal work environment: Working virtually, even though she has a great co-working space. Definition of success: Having a major legal malpractice carrier deciding to cover primary care law as a practice area. 90-day goal: Launch retainer agreements and contact her previous clients to let them know about the new offering. Don’t listen to the people who aren’t doing what you want to do, listen to the people who are your potential customers.